Quantitative easing reduces the duration of assets held by the non-banking sector. If the private non-banking sector wants to adjust back to its previous state then, given that loans create deposits, it will try to reduce loans which also means the reduction of demand deposits (zero-duration assets). 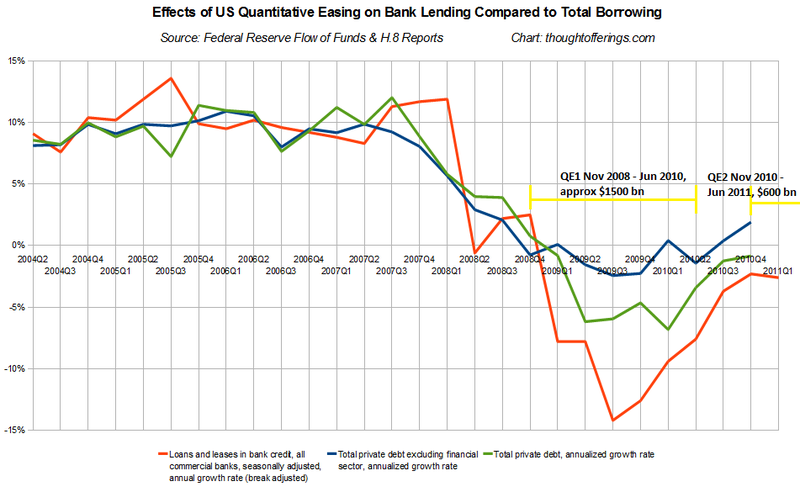 So in a sense QE is virtually forcing the reduction of lending in the economy. Ceteris paribus of course. I mostly like your concise summary, but I am puzzled about one thing. You suggest that the private sector's choice after QE is between holding an increased quantity of short duration assets versus reducing lending in the economy. The argument in this post (something I have not seen elaborated elsewhere) was that there is a third option, one that does not require a reduction in borrowing/lending -- the private sector can simply change the TYPE of its lending. (For example, refinancing from bank loans to other debt, securitizing bank loans, and favoring non-banks over banks for new lending). That allows a shift back to the previous duration mix without requiring anyone to do less borrowing than they want. Well, this is the point with which I can not agree. I actually do not see it as an argument about duration mix and that is why my initial comment might have been confusing. I rather see it as a demand of the non-banking sector for liquidity. A corporate bond which is sold to a household just swaps around a bank deposit. While doing so it also creates an asset and liability of *equal* durations. So no change in duration mix :) And once the settlement system works through you could get to exactly the same state as before you sold your corporate bond. Anyway, no new liquidity is injected into the non-banking sector but you rather use the existing liquidity more efficiently. When banks lend they create a long-duration liability (loan) and a zero-duration asset (deposit). The duration mix of the non-banking sector does change because asset and liability clearly have different durations. More importantly, as long as the payment system is integrated into the commercial banking system, banks have to do maturity transformation whether they like it or not. There is *no*way* banks can get rid of demand deposits that they created *until* loans are repaid (there are certain leakages but lets ignore). That is why the maturity transformation is naturally available only to the banking system. Alternatively government can “purchase” maturity transformation from the private sector by issuing bonds. Non-banking sector alone can not change the *net* duration mix of its financial portfolio. QE stuffs non-banking sector with demand deposits as purchased bonds come from the non-banking sector (as a by-product it also stuffs the banking system with reserves but who cares). The conventional (mainstream) argument says that this supply of deposits will push prices up (yields down) for other financial assets which apparently should have spill-over effects on economic activity due to lower interest rate costs. Well, financial prices might get to a new price-indifferent level (which can be higher as well as even lower) for the available portfolio of financial assets. But why should it have effects on borrowing?! The problem is that you do not need to borrow, i.e. create new deposits, if you are already stuffed with zero-maturity assets upto the eye-balls. So if the private non-banking sector feels that it has too many demand deposits it can try to reduce them. And it can achieve it by reducing net borrowing which by accounting rules also means net reduction in demand deposits. Borrowing is not so much driven by the portfolio desires of “savers” (there are no savers needed as loans create deposits) but rather by liquidity desires of borrowers. The volume of loans in the banking system roughly equals the volume of demand deposits and this defines the duration mix of the non-banking sector. When the Fed steps in with its QE it pushes non-banking liquidity through the roof overwhelming its needs. No needs for new liquidity – no bank-financed borrowing. Hm, on the second thought you however might be right saying that this can also imply more swaps done within the non-banking sector, i.e. capital markets. But then I was also thinking aloud and would love to hear arguments where I went wrong. Thanks for your detailed response! For some reason your comment had gone into the spam folder, but I just released it. You clearly understand the banking system quite well and I agree with virtually everything you say in isolation. So I'll respond to what stands out. "There is *no*way* banks can get rid of demand deposits that they created *until* loans are repaid... Non-banking sector alone can not change the *net* duration mix of its financial portfolio." Neither banks nor non-banks are acting in isolation. It is the actions of the entire private sector added together that matters. QE adds demand deposits to the private sector, as we both agree. 1. There may be added demand from investors for securitized loan products. If banks securitize more existing loans in response, that reduces the money supply (you can see this illustrated in the balance sheet visualizer link above). 2. Some businesses or households may pay off loans or lines of credit from banks early to get other financing, perhaps on slightly attractive terms (bonds, peer to peer lending, etc) instead. This again reduces the money supply, undoing QE's increase. 3. No matter what the total level of borrowing, under the surface there are always some entities borrowing, others repaying, and others not using debt at all. 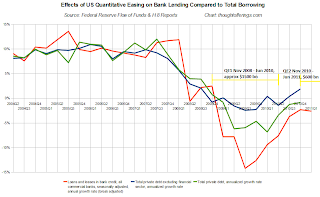 If the extra broad money post-QE helps non-bank funding sources have a higher propensity than banks to fulfill new borrowing/lending needs (due to their increased eagerness to lend), then on balance new lending will be accomplished with less money creation than it would have without QE. So added up to the aggregate level, the increase in the money supply from QE is effectively "undone" over time. I imagine this would have the largest lag of the three sample dynamics I just listed. QE does not add demand deposits to households or non-financial firms -- the data is clear on this. The household sector (or non-financial firms) can purchase a financial sector bond with the proceeds of the sale of the bond to the CB. Of course, nothing can "force" the financial sector to sell a bond to households, but neither can the CB "force" the household sector to sell a bond to the CB. In both cases, the seller will sell with a high enough premium, and you cannot have two different premiums -- one premium for the financial sector selling a bond to households and a different (lower) premium for households to sell a bond to the CB. So at end of the day, household deposit and bond holdings aren't going to change very much as a result of QE. The data is also clear on this. It is as if the CB was conducting asset swaps with the financial sector alone. Thanks for your comment, I would love to be corrected if I am getting something wrong. 3. The net result is that the primary dealer was an intermediary to the Fed buying from the private sector overall, i.e., it wasn't just the Fed buying from the banking sector. I'll follow up when I've read what you've written, thanks! Did you read my post or just pick up on the statement in the middle on the topic of whether QE increases the broad money supply? Admittedly I could have been more precise in that paragraph. I hoped the overall post was clear, though I linked to an earlier one in October that is also relevant and had more detail. Both of our posts reach the same conclusion -- that the private sector controls its mix of asset duration (money/bonds/etc) such that QE doesn't meaningfully affect private sector portfolios. I think we both agree that as an inevitable mechanical outcome of QE, the broad money supply would increase (absent other concurrent factors going on in the economy) if the private sector had no way to make its own adjustments in direct response to the effects of QE. But the reality is that thanks to the banking sector, the private sector CAN adjust its mix of zero duration assets and longer duration assets in response, therefore broad money supply doesn't increase as a result of QE. Our posts describe two different mechanisms that I see as both logically coherent, and both dynamics could easily be happening in parallel. Yours has the mix shifting due to a shift from banks getting funded via deposits to getting funded via bonds. Mine has the shift occurring due to a shift in the proportional of bank loans versus non-bank lending in the structure of the private debt in the economy. Do you see anything wrong with the logic in my post above? Please also read my responses to the previous commenter if the post is unclear. I do have a couple questions about the dynamic you describe that I will ask in the comments of your post. Question .. where did you the money supply from ? Have a link ? There can be many definitions around ..
(Also one technicality if it matters .. the US Treasury was running a Treasury Supplementary Financing Program which was draining reserves at a massive scale but with the debt ceiling near soon, it has used almost all of it). Plus good technicalities in the post - like loans extinguishing removing deposits. I wanted to look at transactions with the foreign sector as well which is much more complicated .. deposit flows (and financial derivatives) can be a lot. BEA doesn't give data in the format, the UK Pink Book does. Btw, where is the MMT claim about QE not changing the money supply ? Before the large scale asset purchases, the Fed was also acting as the lender of the last resort, adding reserves in the process. Don't remember the size. Also, I think there were some positives of QE ... which may or may not have achieved. With low mortgage rates, it was hoped that refinancing will lead to households spending more because they would be paying less if they are able to and will spend the extra (since the Fed doesn't believe in Ricardian Equivalence, thankfully). Also, higher purchases of equities as some BoE official put it, Charles Bean(? ), would bid up equity prices, adding capital gains and increasing consumption. I think the Fed itself has some ideas .. but I guess they are not as good as Post Keynesians in explaining their ideas. "Question .. where did you the money supply from ? Have a link ?" But it's hard to know how much is natural expansion of the economy or an increased private sector desire to hold money (i.e., other factors concurrent with QE) and how much results from QE. It could be that the dynamic described in my posts has a longer lag effect, or that there are practical limitations in the financial sector's ability to transform the mix of private debt in this way. But, the increase does appear less than the about $2 trillion of QE to date. So this dynamic could explain part of that gap, though of course other dynamics are occurring too so it's impossible to say for sure. I tend to look at MZM, M1, and M2 via FRED2, but am not sure what is most appropriate. "I wanted to look at transactions with the foreign sector as well which is much more complicated"
"Btw, where is the MMT claim about QE not changing the money supply ?" Well Bill Mitchell in particular has made this claim, though I've seen it on other MMT blogs (I forget which). However, the statement is ambiguous and he may have intended to encompass the private sector's ability to adjust without wanting to get into the messy details. But, the way I read his wording (perhaps incorrectly), he implies that the Fed buys only from the banking sector and that's why broad money supply doesn't increase. That of course is not true (except maybe in a misleading literal and immediate sense) and I've seen commenters call him on it, but not seen him respond. Well, QE does not change the money supply because reserves are not a part of any aggregate but monetary base. Accidently posted this at RSJ's site. Was meant to go here, so this is a repost. Your description seems somewhat analogous to the MMT description of ‘forcing’ private (household) sector indebtedness during ‘the great moderation’ except that in your story it works via banks’ spreads instead of a through the fiscal stance. Both ‘push’ the creation of ‘money things’ (the endogenous argument) further down the liquidity hierarchy, first from gvt. (via fiscal) to banks (controlled via monetary) and, in the above case, further to the shadow banks or into corporate papers / risk. I find your chart indicates this effect quite clearly. Slightly tangential, but Randy Wray describes the hierarchy story quite nicely in this paper http://www.levyinstitute.org/pubs/wp_656.pdf (just in case you or other readers were not familiar). It helps me picture the paths that ‘money’ creation can take when influenced by policy even if that is in itself no proof for the endogeneity of its creation. Yes, monetary base increases no matter what. But when households and businesses sell their treasuries to the Fed (which does happen during QE via the primary dealers acting as intermediaries), then broad money supply would increase, absent other changes in the economy. These posts address one version of what those "other changes" might be. hbl - interesting post. For MMT to be truly effective at (a) rebutting austerity, (b) demonstrating that no level of govt debt/GDP per se need be a problem, and (c) allaying concerns about bond vigilantes being around the corner, MMT must countenance budget deficits potentially being massively underfunded (ie central bank buying govt bonds). This is the crux of MMT's "silver bullet"; and it prompts the mainstream monetarist critique of MMT - that if carried to its conclusion it could hugely swell cash balances, which would inevitably be inflationary. MMT has to my mind been unconvincing in repelling this ctitique. Mosler commented that QE buys predominantly 1-5yr Tsys from banks, not from the non-bank private sector, which would mean that it was purely bank reserves, but not deposit balances, which were being swelled through QE (and by extension, through any similar underfunding activity). This seems fair as far as it goes, but it would clearly not apply if the Fed were buying longer-dated Tsys, as this would involve buying bonds from the non-bank private sector. So your analysis, showing how even purchasing bonds from the non-bank private sector might result in deposits being unchanged, is particularly welcome. That said, Ramanan commented that deposits have actually risen quite a bit during QE which would seem to counter your argument somewhat. Did you respond to this? I think Mosler is looking too narrowly when he says that QE buys "predominantly 1-5yr Tsys from banks", and other knowledgeable commenters have backed me on that. (Yes that might be part of the mix, but is unlikely the majority). Yes, deposits have actually risen under QE, and I was negligent to not include a relevant graph in my post. I did reply to Ramanan at both 3:16pm and 3:25pm above. There is a lot going on and it is normal for money supply to expand during economic growth. But it has grown less than the size of QE. As I said in the post, it's impossible to prove anything from the data, but it appears highly suggestive to me of the above conclusions. And as I acknowledged, there might be limitations to the dynamic that could cause *some* residual increase in "unwanted" money supply. hbl - thanks for the reference; certainly agree the increase in deposits is much lower than it would be if QE were the end of the story, so there are certainly one or more other effects at play. I think it’s clear that, to the extent QE buys securities from the non-bank sector, it increases deposits per se, resulting in “too much money chasing too little goods/assets”. The question then is what effect has been most relevant in (partially) offsetting the increase in deposits. Your bond vs loan dynamic could be part of it, but unfortunately for me (as an MMTer), it seems that the data is equally consistent with the monetarist account which says that securities prices are bid up which results in a little ‘leakage’ of cash each time an asset is traded. However, in terms of theory, I do think that monetarists are slightly unfair in assuming that agents always try to get rid of unwanted cash balances by spending rather than paying down debt. Sitting in the leveraged financial markets, the narrative which you allude to about loans getting refinanced by bonds is huge – this is the primary driver of the boom in high yield bonds since early 2009. But interestingly, this is generally interpreted as driven not only by banks being capital constrained and wanting to cut back on their lending (ie reduce their assets to improve their actual (as opposed to published) capitalisation), but also about the substantial demise of the institutional loan market (mainly CLOs), in turn driven by the ‘broken arbitrage’ of securitisation no longer providing cheap funding costs for new structures. Not sure how CLOs fit into your account, though. "it seems that the data is equally consistent with the monetarist account which says that securities prices are bid up which results in a little ‘leakage’ of cash each time an asset is traded"
I'm not sure I follow. There can be no leakage of cash when two assets are exchanged. Buying existing shares of stocks, existing bonds, commodities, etc does not destroy any money. The asset and the money just change hands. However, investor perception of things like QE can cause people to bid more or less for certain assets, and the outcome of the bid/ask market scenarios is what sets asset prices. It's all about relative eagerness of buyers and sellers at various asset price points. "Sitting in the leveraged financial markets, the narrative which you allude to about loans getting refinanced by bonds is huge – this is the primary driver of the boom in high yield bonds since early 2009." Interesting... are you saying you have first hand experience that confirms this particular dynamic, at least at a micro level? As for reasons for banks cutting back on lending... it's possible that's part of it, in parallel with what I've summarized, or perhaps that is a rationalization used for an alternative dynamic that isn't widely recognized. As for CLOs, I haven't looked too closely at specific market scenarios such as that, as this isn't even my field (I'm just a hobbyist). There could be individual types of markets that go against the overall trend, or reinforce it, without having to affect what that overall trend is. hbl - another post of mine may have been zapped by your spam filter, but re: the question of whom the securities are bought from during QE, I note from the NY Fed's website that all QE buys bonds from the 20 primary dealers, which means that presumably the purchases are ALL settled with reserve balances, not deposits. So whilst it may be ultimately non-banks which are selling the bonds, won't the increase in deposits at the non-bank sellers be entirely offset by a decrease in broad money at the dealers themselves? Is this the page you were referring to? "Dealers are encouraged to submit offers both for themselves and their customers." hbl - in fact the Fed reference is from http://www.newyorkfed.org/education/lsap/index.html, under "Who does the Fed buy the assets from?" "The Fed purchases securities from a group of 20 financial institutions called primary dealers. Although only the primary dealers trade directly with the Fed, any investor can sell securities to the Fed through the primary dealers..."
Re: bonds refinancing loans, I do have first-hand experience of this. The micro catalyst appears universally to be borrowers buying into a narrative (hyped by i-bankers as I used to be, motivated by capital markets fees) that their loans will not be fully refinanceable at maturity in the loan market - and so they are encouraged to 'diversify their funding' via in the bond market, which, by a happy coincidence, is seeing huge inflows of capital seeking debt exposure. So loans are being replaced by bonds; however, the fall in bank lending appetite is actually pretty minor compared with the collapse of institutional loan market liquidity. Excuse the long-windedness - 3 more points. A. "leakage of cash when two assets are exchanged" - I should put the monetarist point more clearly. The claim is that economic agents have a desired ratio of money to expenditure and prices determined by habit and convenience. If money (deposit) balances increase, then agents will try to get rid of their excess money by increasing their purchases of goods, services or assets. Whilst - as you point out - this does not get rid of money in an aggregate basis, it could mean that prices increase until the private sector's target ratio between its aggregate money balances to its level of nominal expenditure and prices is restored. So this could explain the increase in asset prices post-QE [although I think, per Mosler, that the increase in fact results from investors’ misunderstanding QE and ought to reverse], although, to your point, this mechanism wouldn't explain how the increase in deposits had been so much lower than the first-order effect of QE would suggest. B. agree that QE buying directly or indirectly from the private sector will inflate non-bank deposit balances just the same; but you imply any impact on a dealer's balance sheet is temporary. Isn't it actually a permanent impact? Reserves seem to increase when the Fed buys the Tsy, but what decreases when the dealer buys the Tsy from the non-bank? C. Finally, allow me to spell out a monetarist attack on endogenous money theory in general, with which I am grapping at present. If it’s correct, it might challenge much of the attractive-sounding material by Lavoie which you kindly linked to. In "Money and asset prices in boom and bust" (2005), Tim Congdon attacks the endogenous money school, in the form of Kaldor, for claiming that economic agents adjust their money balances primarily by flexing/adjusting their bank borrowings (ie when corporates expect growing demand, they will borrow to finance growth in output, whereas when they expect contraction they will use their deposits to pay down debt). Congdon’s main issues are (on p74ff) that most deposits are held by agents with little or no bank loans to flex: retirees, in the case of household deposits, and the pension and insurance industries,in the case of financial sector deposits. Note that these sectors saw significant fluctuations in deposit balances in historical (UK) booms. Additionally, historical data on bank borrowings for financial sector show a low correlation to level of deposits. A. Thanks for clarifying the point. I think that IF you assume the money supply is not endogenous, THEN it is reasonable to assume that an increase in the money supply will probably drive up [some] prices due to the increased bids for those things. But that first IF clause is important and as you know I think it may not hold true. Also, which prices would go up? Asset prices -- probably. But what about a rise in CPI inflation that is validated by a rise in wages? That would depend a lot on the current structure of the labor market, and is far from a sure thing with labor's limited bargaining power. As for recent asset prices concurrent with QE -- the story with stocks is really one of extraordinary earnings growth (even if it may not prove sustainable). So I don't think you need QE to justify current stock prices. But commodities are another story and certainly might have been impacted by QE-related sentiment. B. I think we are probably on the same page here and I just expressed my point poorly. The "temporary" comment was simply around whether when the Fed buys treasuries from non-banks there is a temporary impact on PDs balance sheets' or not, and it doesn't really matter to the larger discussion. C. Very interesting!! My initial impression is that Congdon is attacking a very narrow fragment of the broad money supply endogeneity dynamic. There are many mechanisms at work allowing the money supply to be determined by the private sector, and I'm planning to do a post at some point listing them more explicitly. Let's assume it's correct that those with no debt (e.g., retirees) hold the majority of deposits. If you give those entities end up with more deposits than they want, they will attempt to [for example] buy more corporate bonds. That will give borrowers (such as corporates) alternative ways to borrow than bank loans, limiting the growth in the money supply by reducing one of its growth drivers. So I don't think the narrow example that "economic agents adjust their money balances primarily by flexing/adjusting their bank borrowings" is representative of the entire endogeneity mechanism. As to "historical data on bank borrowings for financial sector show a low correlation to level of deposits"... Again this is looking at deposit assets and loan liabilities within an individual entity or industry. I think it's more relevant to look at deposit assets and types of liability (loan or bond/equivalent) across entities. I agree with you that Congdon's critique of endogeneity seems too narrow, but I would put it slightly differently. I think he is probably correct to highlight the private sector as attempting to get rid of excess money balances. Now, the obvious way for the sector as a whole to get rid of such balances is by repaying bank debt. Congdon believes that this attempt effectively fails (leading instead to rising asset and/or goods prices), because he sees a mismatch between those sectors with excess cash and those with bank debt to repay. But as you point out, recent history provides a good example of excess cash in one sector (asset managers) finding its way to repay bank debt in another sector (corporates). The key question is whether, if the private sector in aggregate desires a cash balance of 100, and a central bank injects a further 20, the private sector will find a way to pay down 20 of debt to get rid of the ENTIRE 20, to return to the 100 figure. This is I think what it means to contend that QE has no impact on the money supply. This is quite a strong claim and whilst I’m partial to it, I’m not sure it has been fully substantiated, either empirically or theoretically. So I look forward to seeing more posting from you on this topic..
"The key question is whether, if the private sector in aggregate desires a cash balance of 100, and a central bank injects a further 20, the private sector will find a way to pay down 20 of debt to get rid of the ENTIRE 20, to return to the 100 figure." Just to be clear, my point has always been not that the private sector would "pay down 20 of debt" but that it would be more likely to "shift 20 of debt from bank debt to non-bank debt". Yes, it is a strong claim given that it's not discussed anywhere else that I've seen. hbl - yes I appreciate that your point is (i) about shifting debt from bank to non-bank sources rather than paying it off entirely, and (ii) expressed in terms of being likely, rather than inevitable. What I meant to say was "...would pay down 20 of bank debt", which is what is required for the private sector to get rid of these excess deposits. I do think the claim, that the 20 will inevitably be shifted to non-bank lending (or else simply repaid), is a strong one. It doesn't sound like you're making it, although perhaps you are tempted by it; I know I am!